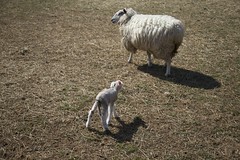 It was just about as perfect a March day as we get here, so we headed off to Over the Grass Farm, to pick up milk, and sure enough, they had tiny little lambs running around the sheep paddock. The wee ones are probably about a week old, possibly less, and are probably just about the cutest thing ever. Mama sheep was less interested in the photo op and bleated angrily as we got close to the fence. I was able to snap a few frames, though, before they trotted off. Six months, precious, and you will be mighty tasty even cuter.